The Central Dogma of biology is…well…central to biology education. Students learn about DNA, how DNA is transcribed into RNA, and how RNA is translated into protein. (And at least in the beginning, we ignore all of those pesky complications like non-coding RNAs.) 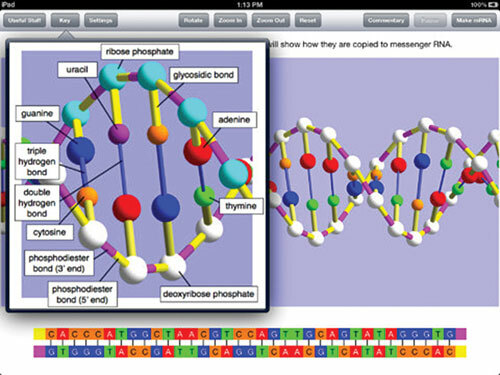 The OnScreen Gene Transcription app for the iPad does an excellent job bringing DNA transcription to life via an interactive 3-D DNA model and a simulation of the transcription process. Users can completely interact with the model during the simulation, zooming in and out, rotating it, and moving it around on the screen. The simulation itself is divided into small sections (although the user can turn off the “pause” feature) that are accompanied by a summary line of text on the screen, as well as a more complete description of each step from a pull down menu labeled “commentary.” In addition to the transcription simulation, the app includes quite a nice background section entitled “useful stuff” that students will, in fact, find useful.